Time to "Put some Jam on the Bottom Shelf where the Little Man can Reach it!" "Put the jam on the bottom shelf so the little man can reach it," Sen. Ralph Yarborough used to say in the 1950s and 60s, when Texas still elected populist democrats to the Senate. Well, it's time for Obama and the Congress to put some jam, in the form of stimulus and jobs (like a new WPA) in the reach of the little people, because if they aren't careful, the little people are about to get dragged back over the precipice into a chasm of wage deflation. Read more about Time to "Put some Jam on the Bottom Shelf where the Little Man can Reach it!" This morning the BLS reported that consumer inflation remained unchanged (seasonally adjusted) in June, declining -0.2% NSA. Year-over-year prices have fallen - 2.1% into deflation. YoY consumer deflation is only surpassed by 1949's -2.9% in the post-Depression era. In the Optimistic scenario, the fiscal and monetary stimuli, together with intelligent new political leadership in Washington, halt the meltdown perhaps by mid-year, and wage reductions remain the exception. In the Pessimistic scenario, the stimuli fail, and wage reductions spread, leading to a wage-price deflationary spiral. In both the academic and political blogospheres, there are parallel but different discussions going on about the same point: this recession is far more severe in terms of unemployment than the 2.8% loss of GDP from peak would predict. 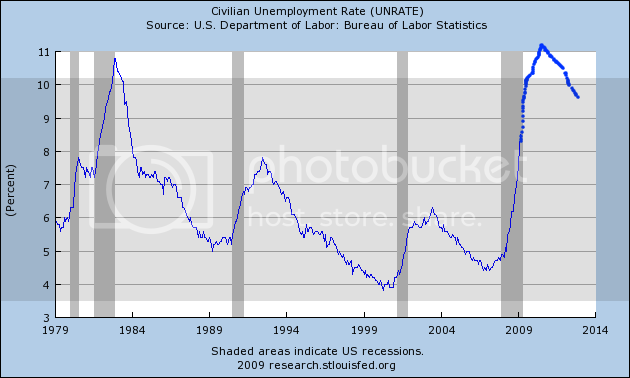 At 9.5% and increasing the unemployment rate is approaching rates only seen once since the 1930s, as almost 8 million jobs have been lost in the last year and 7 months. This morning the Census Bureau reported that Housing Starts increased to 582,000 in June from May's upwardly revised 562,000. Year-over-Year starts are still down (-46.2%). I'm unable to post graphs at the moment, but Calculated Risk has an excellent one, showing that housing starts are a leading indicator, always borttoming before the end of recessions. Note the recent strong turn-up in our current recession looks like the harbingers of recovery from past recessions. This is a continuation of a monthly series that up until now has been called The Deflationary Bust Deepens. Each month I have been tracking the progress of this first full-fledged deflationary bust in over 50 years, comparing the progress of deflationary consumer and producer prices now with the pattern of the 5 deflationary busts between 1920-1950, including the Great Depression. Yesterday morning the BLS reported that consumer inflation increased +0.7% (seasonally adjusted) in June, (rising 0.9% non-seasonally adjusted). Year-over-year prices have fallen - 1.4% (NSA) into deflation. YoY consumer deflation is only surpassed by 1949's -2.9% in the post-Depression era. Parts II and III of this series can be read at The Bonddad Blog. By far, the biggest threat to a bottom being put in to this Recession, is the continuing drumbeat of new layoffs. Thursday's June employment figures over - 450,000 and new jobless claims that have stubbornly, week after week, remained above 600,000, put the kibosh on any idea that the bottom is already here. We simply cannot stand 600,000 people putting in for jobless benefits, week after week after week. And the source of the continuing drumbeat of jobs lost appears to be coming more from anywhere else from the location of what Paul Krugman has called the "50 little Hoovers", i.e., the state (and municipal) governments, which are obliged to balance their budgets and so must throw employees out of work and cut back on spending projects, exactly when they are needed most. "I would not be surprised if the official end of the U.S. recession ends up being, in retrospect, dated sometime this summer," he said June 8 during a lecture in London. However, Krugman argues people didn't listen to his entire speech, which included dire predictions about lingering unemployment. "There's a big difference between the end of a recession, which is really only when some things start to turn up, and the return to prosperity," Krugman told ABC News. "I think what people don't get is the difference between the end of a recession in a technical sense and actual recovery, which matters to people." A few months ago, I noticed something that seemed strangely discordant about our "Great Depression 2": consumers were refusing to stay dead, but instead showed signs of - at least partially - rising from the grave. But a look at truck traffic (which is only posted monthly) and rail traffic (which is updated weekly) showed a continued year-over-year slide. I took a further look because one very prominent blogger has recently alluded to rail traffic several times, most recently saying it was "horrible" and "13-week moving averages are still moving lower, with no apparent end in sight" So, what's going on? Does rail traffic in particular mean the recession is continuing to plunge deeper into the abyss, or are there signs of some stabilization?